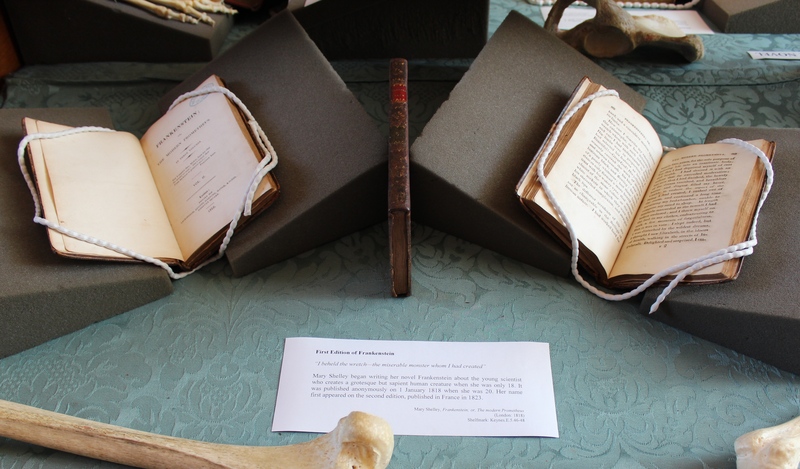 Last weekend we put out an exhibition in King’s Library on the theme of gothic horror, marking two hundred years since the publication of the iconic novel Frankenstein by Mary Shelley (1797–1851) in 1818. 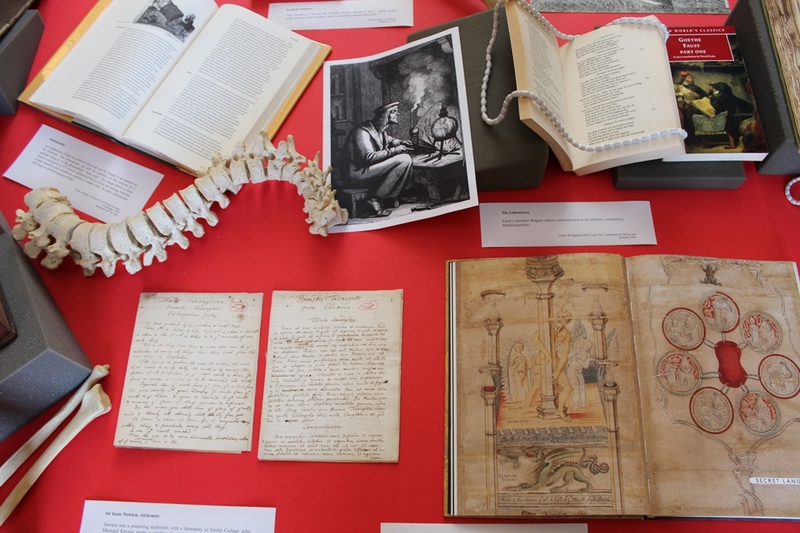 We are delighted to share some of the treasures of that exhibition with you here. 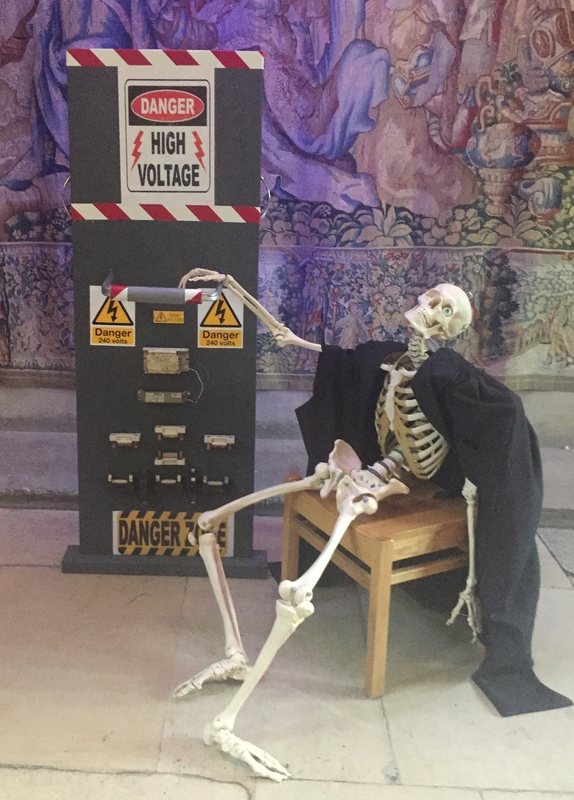 Bony Tony, King’s Library’s skeleton, let loose on the world at large . . . 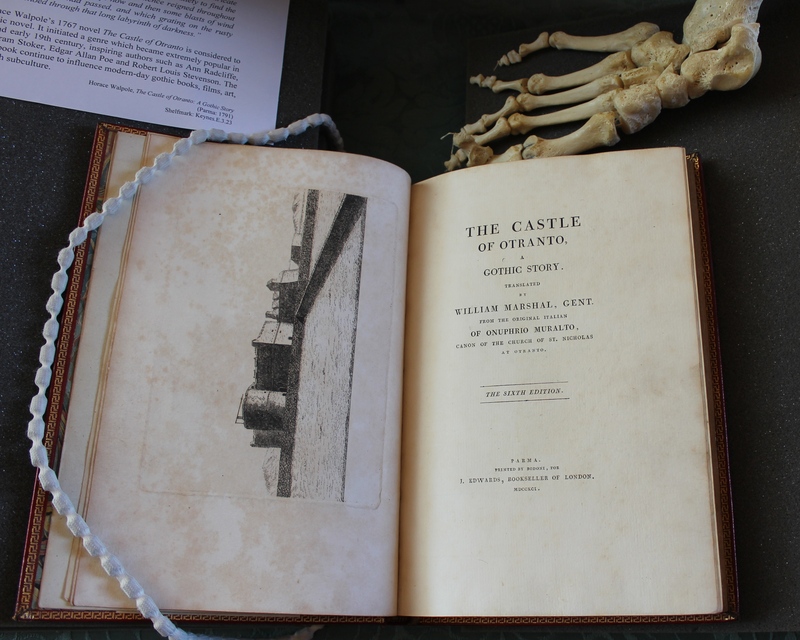 It all started with Kingsman Horace Walpole whose 1767 novel The Castle of Otranto is considered to be the first gothic novel. It initiated a genre which became extremely popular in the later 18th and early 19th century, inspiring authors such as Ann Radcliffe, Mary Shelley, Bram Stoker, Edgar Allan Poe and Robert Louis Stevenson. The aesthetics of the book continue to influence modern-day gothic books, films, art, music and the goth subculture. Walpole was so interested in medieval history he began building a gothic-style castle in Twickenham in 1749 which he called Strawberry Hill. The world-famous house and gardens are open to the public today. 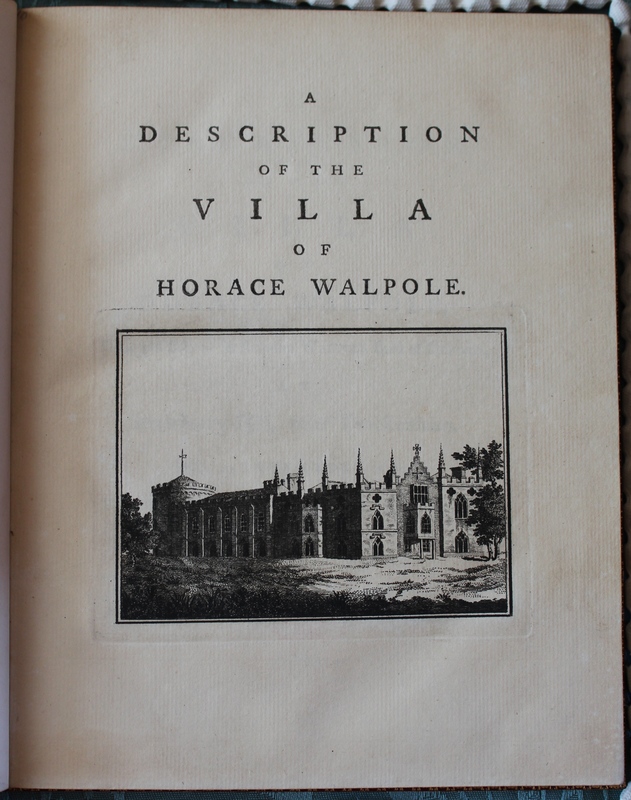 In 1786 Walpole published a description of the villa which included an engraving of what it looked like at the time, as well as an inventory of the furniture, pictures and curiosities it contained. 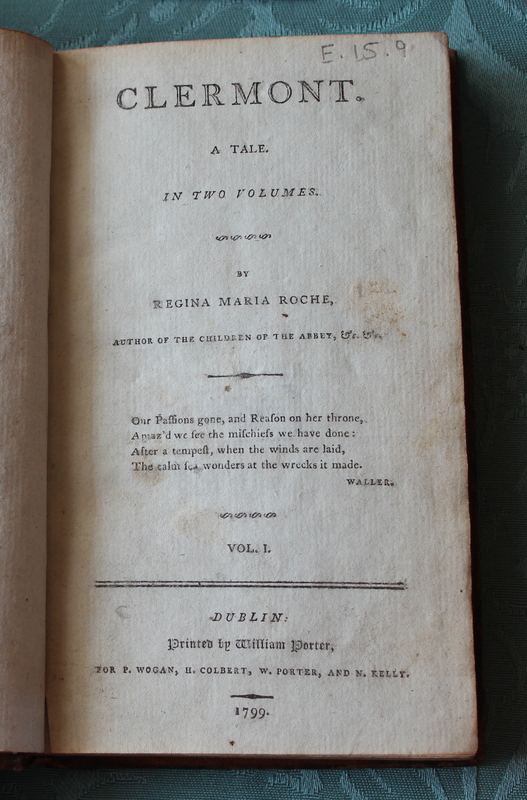 One of those novels, Clermont, was written by Regina Maria Roche (1764–1845), who is considered today to be a minor writer of gothic novels, but she was a best-selling novelist during her life. 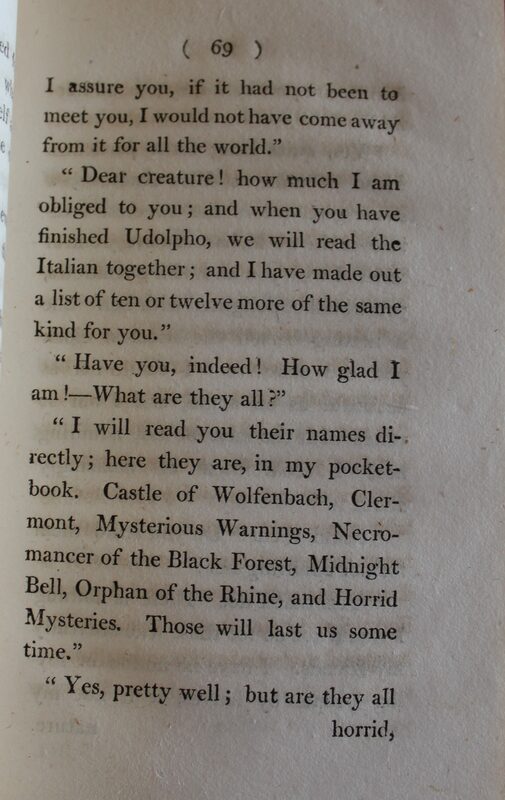 Originally published by the sensationalist Minerva Press, Clermont first appeared in 1798. It tells the story of the beautiful Madeline, who lives in seclusion with her father (the Clermont of the title) until they are visited by a mysterious Countess from his past. Just after Jane Austen’s death in 1817 arguably the most famous gothic horror story of all time was published: Mary Shelley’s Frankenstein. Shelley began writing her novel about the young scientist who creates a grotesque but sapient human creature when she was only 18. 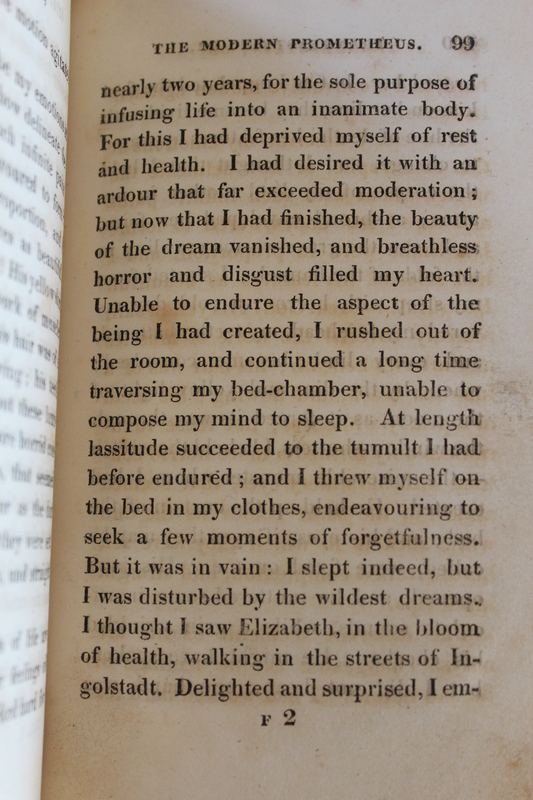 It was published anonymously on 1 January 1818 when she was 20. 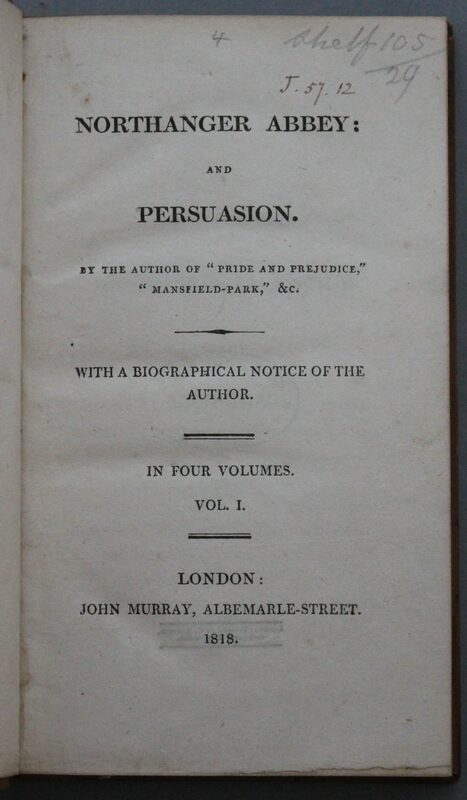 Her name first appeared on the second edition, published in France in 1823. 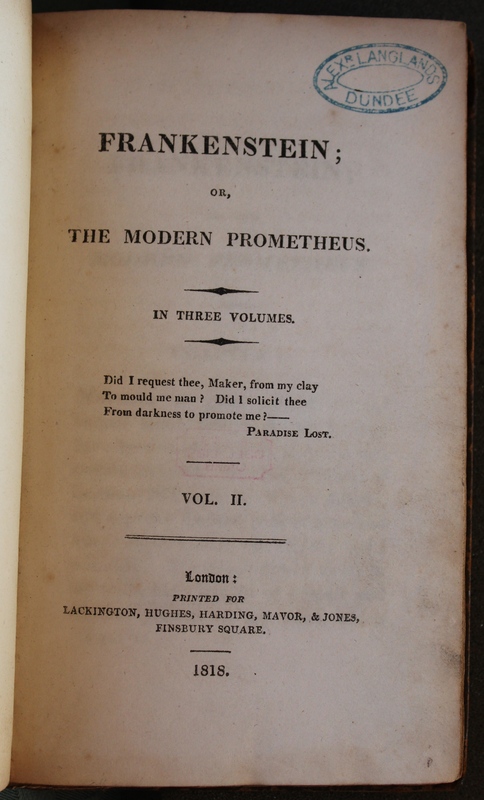 The three volumes of Mary Shelley, Frankenstein; or, The modern Prometheus (London, 1818) (Shelfmark: Keynes.E.5.46-48), first edition. Famously, the story of the monster had its origins in a horror-story competition held in the Villa Diodati near Geneva, where Mary, her lover and later husband Percy Bysshe Shelley, Lord Byron and others whiled away the evenings in 1816. Mary Shelley’s story has inspired countless comics, pop-up books, plays and films and continues to do so to this day. Victor Frankenstein is repulsed by the monster he has created. In 1832, Johann Wolfgang von Goethe (1749–1832) also included in Faust Part II the creation of an artificial man, a ‘homunculus’, created in the lab by Faust’s assistant Wagner. Goethe was tapping into an older science, that of alchemy, for his story. The ability to make this small human or homunculus was often discussed in alchemical writings of the seventeenth century. The homunculus can also be symbolic of the creation of a spiritual being or of the philosopher’s stone itself. Below we see Heinrich Khunrath, a Christian kabbalist and alchemist. On the left hand side he kneels in prayer in his Oratorium, on the right hand side is his Laboratorium. 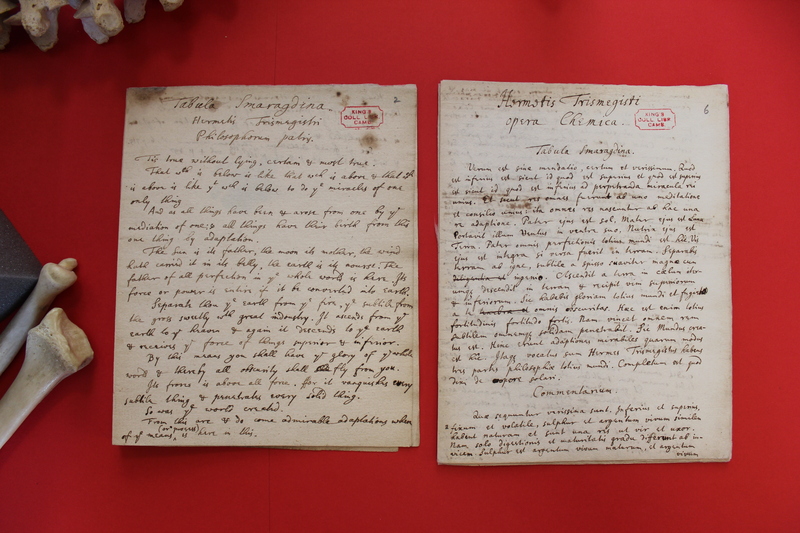 Khunrath described the making of the homunculus with the aid of malign spirits as ‘Desperatio.’ This copy was owned by John Ruskin. 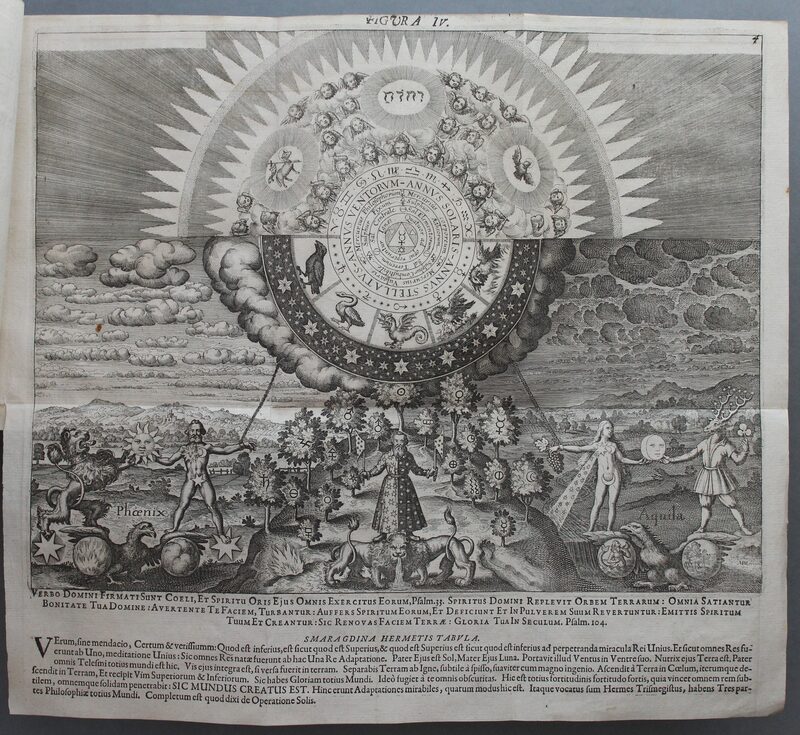 Below we see an engraving by Matthaeus Merian (1593–1650) which represents symbolically the text of the Latin Emerald Tables, a foundational work of transmutational alchemy attributed to the legendary Hermes Trismegistus. The layers of meaning in the Emerald Tables have been associated with the creation of the philosopher’s stone. Probably the most famous alchemist was Isaac Newton (1642–1727), who had a laboratory in Trinity College, Cambridge. John Maynard Keynes (1883–1946) wrote a celebrated paper on Newton, ‘Newton the Man’, published only after Keynes’s death in 1946. 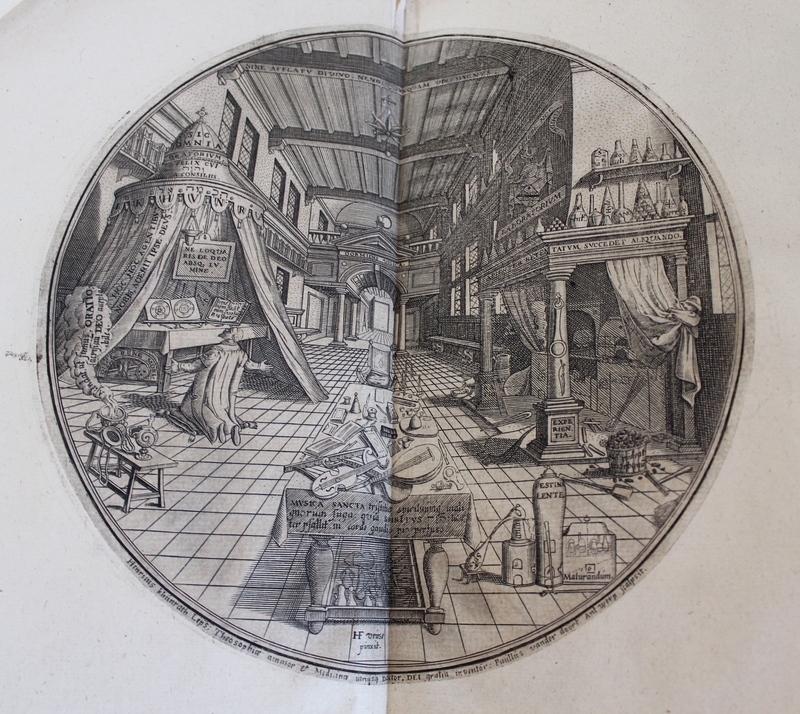 In it he described Newton’s alchemical writings, of which he had formed the outstanding collection (now at King’s), and explained how historians had contrived to ‘hush up’ this side of Newton’s activities. Newton, said Keynes, was ‘the last of the magicians’. Back at King’s we have our own twentieth-century tradition of horror stories, starting with former King’s Provost M. R. James (1862-1936), who is most famous to the wider public for his published ghost stories which he would read to students at Christmastime (a tradition reinstated by our current Provost). 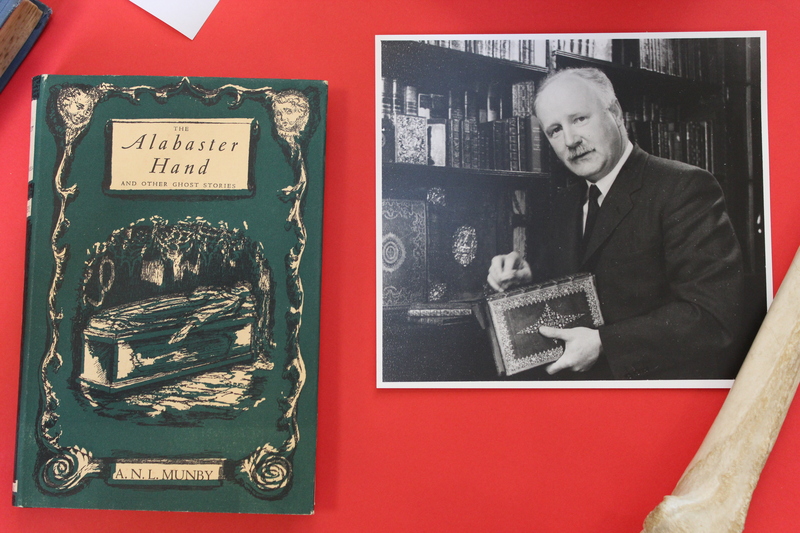 Tim Munby (who was Librarian at King’s from 1947 to 1974) continued along this path with his collection of ghost stories The Alabaster Hand.